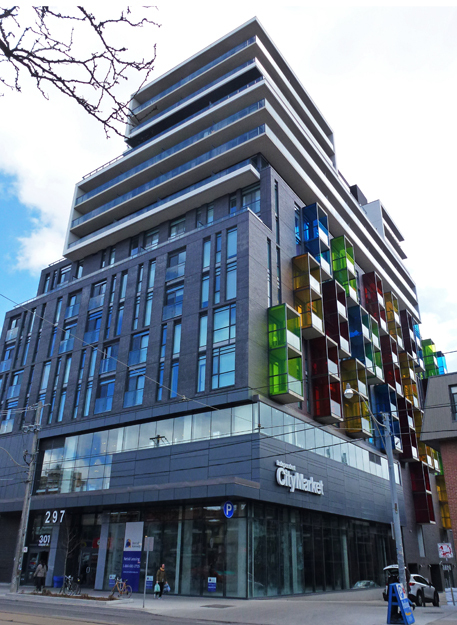 I really liked these colourful balconies when I spotted them on a College St building. They are quite tiny but they must bring a lot of colour into the units. I must go back when it is sunny to see how they glow. Oh yes, those are very nice indeed. I bet they throw off all kinds of colorful patterns when the sun I shining on them. They look good and I think balconies are wonderful things but these don't seem attached well enough to the buildings. I'd be leery of spending much time out on them. :) But you know I don't like heights to begin with. Looking forward to the sunny day picture. It should be interesting. They really make the building! We definitely need more colour in our world! ...quite different from anything that I've seen before. The splashes of colour look great. They add so much color to the building. I like it. Hello, I like the colorful balconies, a great splash of color. Unusual modern building. Looks like a pleasant place to have an apartment. The balconies really add interest!